A thin-film chemical sensor coated onto an electrode offers a simple, practical way to detect minute traces of toxic gas. Sensors that use metal-organic frameworks (MOFs) can be highly selective for a particular gas because of the porous nature of these crystalline materials and their nanoscale cavities. 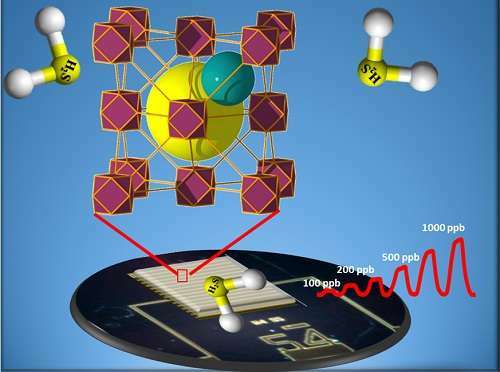 Recently, Saudi Arabia's King Abdullah University of Science and Technology (KAUST) researchers developed a MOF-based sensor that can selectively sense hydrogen sulfide at concentrations of just a few parts per billion (ppb). Their method of altering the structure of the MOF electrode coating allows them to detect a range of gases. Better known as "sewer gas" for its characteristic rotten-egg odor, hydrogen sulfide doesn't just smell bad; it is harmful to humans at concentrations as low as just a few parts per million (ppm). In industrial settings, where hydrogen sulfide release is a risk factor, including oil and gas refining and sewage treatment plants, gas-sensing systems based on gas chromatography are typically deployed; however, these systems are bulky, complex and expensive. A much simpler sensor has now been developed through collaboration between the KAUST research groups of Khaled Salama, Professor of Electrical Engineering, and Mohamed Eddaoudi, Professor of Chemical Science. By altering the metal and organic components of the MOFs used in Eddaoudi's sensors, the team fine tuned the size and shape of the pores and altered the cavities where gases enter. In this way, the material becomes highly selective at adsorbing a particular gas. Eddaoudi recently developed MOFs based on rare earth metals using particular organic linkers that allowed the construction of a MOF with a face-centered cubic (fcu) topology. He explained that this topology is showing a promising selectivity for the adsorption of hydrogen sulfide. "The exceptional thermal and chemical stability of these MOFs and their high selectivity for the adsorption of H2S encouraged us to explore the fcu-MOF platform for the sensing of toxic gases, such as H2S." "Unexpectedly, the sensor was not only able to perform well in the detection of H2S gas in the ppm range but also in the ppb range with a detection limit of about 5.4 ppb," Eddaoudi said. "This exceptional sensing performance paves the way for the deployment of MOFs as practical sensors for various detection applications of toxic gases and vapors."